Maybe it's a VA thing, but we battle stink bugs bad here. My husband leaned over to give me a quick hug and recoiled in horror. At first I was a little taken aback as he's usually very loving. That quickly passed as I realized that a nasty little stinkbug had taken up residence in the hood of my sweatshirt. Apparently I was his girl and he was attempting to defend me from the perpetrator (my hubby) by releasing his odoriferous cologne. I hate those things! That mouse is so cute!!! The possum is NOT cute. I caught a possum last summer - set the trap for a woodchuck eating my garden and forgot to close it at night and the possum got in. . . I waited for my husband to take care of it! Never a dull moment at your place! I don't have much problem with critters since we moved to civilization. We used to live out in the woods on a 100 acre farm, there were all kinds of mice, snakes and wild animals there. We had mice in our crv before we got our van. Shaune would do live traps and then drive out to the woods to set them free. Deaglan would proudly tell anyone he came in contact with that we had mouses. You sure have a lot of visitors! We only get ants at our house. I think I would be most terrified of that cat too! I'm glad it didn't go after you! At our other house just two block away we had hobo spiders every summer. Those suckers were huge!! In this house, we still have spiders but they are smaller, and the only varmint seems to be Willow when she tries to steal Kona's food. Good luck with all of your animal issues-and you'll be hearing from me soon, I promise! Yikes--glad the cat story did not end with an injury. I think an advantage to living in cold and blah land up here is that the critters are not seen much this time of year. We haven't had ant unwelcome guests this winter, but two years ago we had a family of mice move in. I think we caught 10 in two weeks. We tried every different kind of trap...the glue traps were the worst, I always felt so bad for the little mice that got caught in those, they look so innocent. oh lordy! you've got your hands full! so i guess the dryer sheets inside the van are not working to keep the mice out, after all! ugh! i could never do glue traps. i'd have to snap 'em or nothing at all. Those mice might be cute - but think of it this way: they can carry disease. Blech. (I don't blame you for having your husband put them out of their misery, though). When I first seen the cat in the trap I thought it was your cat! That is just hilarious that it wasn't your cat! I can't believe you still have the mice in your minivan! We have been super lucky but The Captain tells me that our "cat house" aka quonset has dead ferrets in it. I didn't even know we had ferrets around here. I've never seen them...just hoping some day that one never decides to take up residence in my house!!! I just don't get the whole mouse in the minivan thing! That's so crazy to me! I guess you can't use snap traps because of the motion of the vehicle? They sure would do the whole trick at once though! Trying not to laugh Lisa as I know it can get a bit much sometimes. I have a Varmint rat that is determined to live in my greenhouse despite me doing everything to deter him. We deal with mice and earwigs in-mass. An occasional raccoon or deer ventures in, but not too often. Finally found that ashes get rid of earwigs. But, we are constantly catching mice, especially in the fall when they want to come indoors! Good luck with all your varmints! Well, yes, we had our share of varmint issues in other winters. One winter we actually realized that rodents (rats) had gotten into our heating pipes and pee peed in the insulation under our Man. Home. John had to pull everything out from underneath the home and we were sitting in the home with area heaters. They run your bills up fast. Horrid varmints! It cost us a lot of time and about 2000,00 dollars to get new insulation and everything running again. This winter only a single mouse now and then. He is in my workspace though. And that is off limits! So we kill one we gain one it seems like. In MO. we were tormented by bugs... huge bugs... and my boys always got eaten alive! Well, there will always be something until He comes to get us all! As a matter of fact, we HAVE!!! But not the feral kind. Phil was taking care of our son's cat while they were away, and chuck has always been a big nipper. Well, he bit and scratched Phil really good while he was scratching his back. It bled for some time and now all the puncture wounds are getting red all around! Your mouse picture is too cute, awwwww!!! Can't say the same for the possum. That rooster needs some serious therapy! 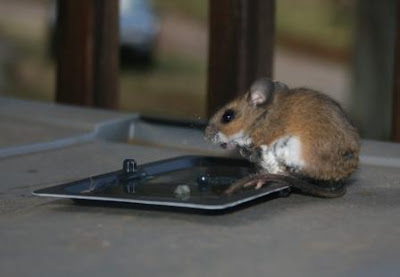 A friend of ours (Ella's mom) has mice in her house inside and had to set traps. One day she was on the toilet and a mouse ran in front of her. She screamed and hubby came running in and whacked the mouse. Not only did he kill it, but it was full of babies!!!! Little Ella slept through the whole thing! One question-do you have your rabbies shots? I'm serious! Wow, it sounds like the attack of the rodents. I still say my drowning trap is the best way to get rid of mice and skunks-whatever! I feel like that's the worst part of winter in the country... and probably the one thing that keeps me living int he burbs, even though my heart screams "TAKE ME TO THE COUNTRY!" Oh my gosh! I'm so sorry, but I can't stop laughing! I have no idea how you get mice in a minivan, but I wig out with the glue traps too, then cry because the cute mouse is stuck in the glue. 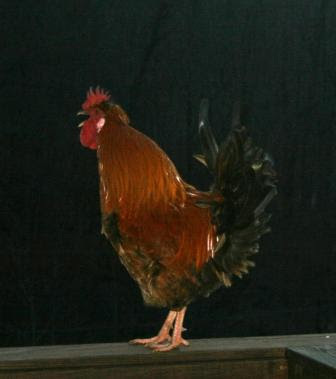 Our rooster (Tom Jones) did the same thing; always at 3 a.m..
Those feral cats - yeow! Got a lot of those over the years. Had one projectile poo all over as soon as I got near it, then it attacked us. Horrible things after they've been caged. What's with the stink bugs? Do they actually stink? We do have plenty of varmits plus a farm full of coyotes that howl at 2am and get the dogs started up. Nice. The only varmints we have here are ants once a year and the occasional stink bug. Well we did have racoons eat our goldfish right out of our deck pond. It's too bad your cats are older, otherwise they might keep those mice under control. But you have it under control. That ferral cat can bite- my mommy knows! OOh, the mouse and possum would freak me out!! Certain places seem to attract vermin more than others ... we've had a couple of houses that seemed very welcoming to mice. Might have had something to do with cornfields nearby! And our cat was no help. Good luck! cute yes....but totally creeps me out. I'd be freaking. You're one brave lady. Haven't had to fight any off.I had a possom problem a few years back, babies found a way into my cabin. I'll tell ya, there's nothing worse than a mixed up rooster or a mad catter! Well, maybe a pi$$ed off possum. 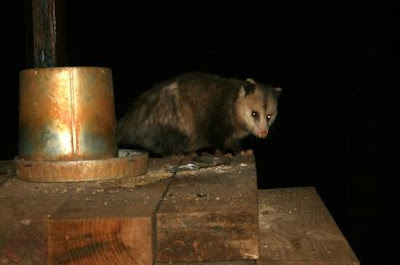 We caught a possum in a trap once and I fed it hot dogs till Six came home to take it away. Needless to say we had possum problems for quite some time. lol sorry but your varmint trouble is quite funny to read about...we haven't had too many stink bugs this year, not like last year! and a couple of years ago we did have a mouse in the mini van. didn't know until we were on our way to smith mountain lake and it made an appearance, we were all screaming lol...it kept popping up all over the place. we stopped at dollar general and my husband bought some sticky traps to lay under the seat but we never caught him. he did pop up onto the dashboard right by my husbands hand. it was quite an intense ride to the lake with us all sitting with our feet in our seats. he must have jumped out at the lake because we didn't have anymore issues after that! You are much braver than me.. THe whole thing would have freaked me out. You go girl! Oh I feel your pain. One of the reasons we moved out of the 'old' house was rats/mice in the attic and possums in our crawl space. We had feral cats, I'm sure bc the exterminator would comment about their 'use' of the side of our house...I don't miss the critters at all! We just have squirrels here mostly and my boys scare them away most of the time! I hope you catch all the mice!! Worse things we get out in the desert are grasshoppers and spiders. They come from nowhere and get into your home. And the desert spiders here are pretty big. Black and red. Nasty suckers. Mice are so cute BUT so distructive~! I gave up on traps and put out the poison that just kills the mice. The red tail hawks and eagles will not die if they eat one of these dead mice. I put out 4 boxes one evening and by morning they were all empty..
Now to get through the smell, yikes they do stink. Good luck~! Thanks for your encouraging comment about the knee.. With time and patience it will get better. So that would scare the you know what our of me. We actually have had to deal with bobcats here! That cat does look angry! I also think the mouse is so cute...though maybe not if he's in my mini-van! :) Good luck! Hoping you don't have a fifth. Eeeeewwww, I couldn't handle all those varmints! Esp that possum. He looks downright evil! Você pegou o gato em vez do rato? Maybe you should keep that cat! He could take care of some of those varmints. We had ratzilla last year in the barn. He made tunnels under the horse stall mats and excavated about a half ton of gravel. Never a dull moment when it comes to varmints. 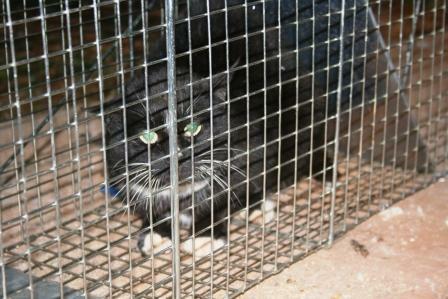 I have never trapped a feral cat but that is on my list this week...I hope my luck is like yours! That possum freaks me out! The cat doesn't scare me as much as that possum does! They can be really mean. They all love your house (and van!). That mouse is too cute!